Wirelessly networked systems of intra-body sensors and actuators could enable revolutionary applications at the intersection between biomedical science, networking, and control with a strong potential to advance medical treatment of major diseases of our times. Yet, most research to date has focused on communications among devices interconnected through traditional electromagnetic radio-frequency (RF) carrier waves. The main obstacle to enabling this vision of networked implantable devices is posed by the physical nature of propagation in the human body; composed primarily (65%) of water, through which RF electromagnetic waves notoriously hardly propagate, even at relatively low frequencies. We take a different perspective and propose to investigate and study the use of ultrasonic waves to wirelessly internetwork intra-body devices. Propagation: Ultrasonic waves are subject to lower absorption as compared to electromagnetic waves, mainly because of the significant water content in human tissues. Health Concerns: UC have been successfully used for therapeutic and diagnostic purposes inside the human body since the 1960s with no detrimental effects. On the contrary, the medical community is still divided on the risks caused by exposure of human tissues to RF radiations. Interference Management: RFC may raise significant electromagnetic compatibility concerns, since environmental or malicious interference may potentially jam intra-body RF devices. The first step towards the design of high-performance ultrasonic networked systems is to characterize in detail the ultrasonic propagation channel in tissues. We use a deterministic propagation model, based a propagation simulator suited for ultrasonic intra-body communications. A realistic channel model of ultrasonic signal propagation in human tissues that incorporates attenuation, scattering and multipath needs to satisfy three coupled first-order equations simultaneously, which represent relationships among acoustic pressure, acoustic particle velocity, and medium density. The solution represents the acoustic field behavior in time, evaluated at each spatial coordinate of the propagation medium. 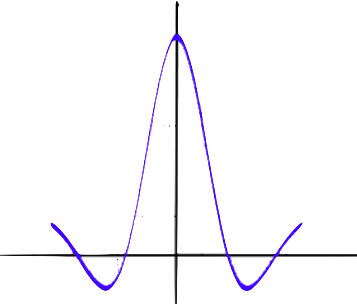 We solve the partial differential equations using a computationally more efficient approach based on the pseudo-spectral and k-space methods implemented in Matlab (k-wave). 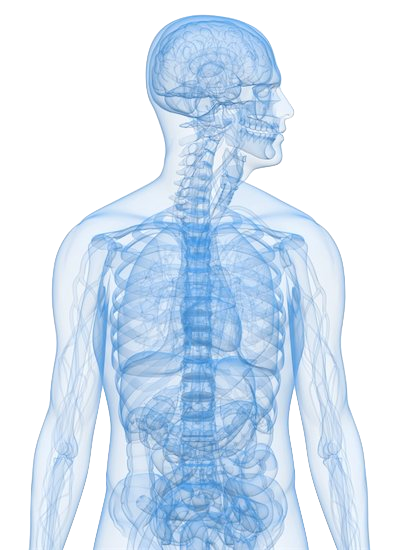 An appropriate physical layer scheme needs to be designed to achieve low-complexity and reliable communications against the effect of multipath reflections and scattering within the human body, but also limit the thermal effect of radiations, which may be detrimental to human health. Broadly used carrier-modulated waveforms are strongly affected by multipath replicas that destructively overlap in time, and continuous waveform can also produce undesired bio-effects. Based on this, we designed and proposed a new ultrasonic transmission and multiple access technique, which we refer to as Ultrasonic WideBand (UsWB). Ultrasonic WideBand is based on the idea of transmitting very short ultrasonic pulses with an adaptively controllable duty cycle following a pseudo-random adaptive time-hopping pattern, and with a spreading code of adaptive length superimposed. Impulsive transmission and spread-spectrum encoding combat the effects of multipath and scattering and introduce waveform diversity among interfering nodes. The design of a distributed MAC can enable multiple access and combat the effect of interference, thus allowing users to share the communication medium fairly. Unfortunately, the characteristics of the ultrasonic channel make the design of an efficient MAC protocol for in-body communications a challenging task. 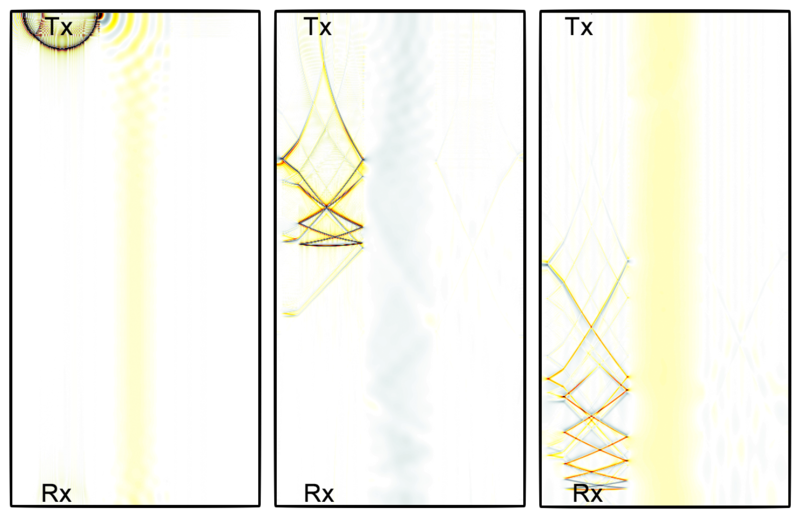 Multipath: caused by the inhomogeneity of the medium, strongly affects narrowband signals. Delay: caused by the low speed of sound in the medium, makes implementation of efficient time-division and carrier-sense schemes challenging. Ultrasonic WideBand, using a low duty cycle impulsive transmission together with a superimposed spreading code allows different users to coexist in the same channel. Dynamically adapting the time-hopping frame length and spreading code length allows to implement a MAC protocol that does not require mutual temporal exclusion between different transmitters, and optimally, and distributively regulate tradeoffs among resilience to interference, achievable information rate, and energy efficiency. The development of tools and frameworks for validating the designed system is a key feature ultrasonic IBAN. Experimental platforms and testbeds can offer sophisticated engineering approaches to provide realistic testing results. Unfortunately, no off-the-shelf solutions are available for ultrasonic BANs. We designed a software defined experimental platform and testbed architecture for ultrasonic intra-body area networks, based on Universal Software Radio Peripheral (USRP) N210 software-defined radios. The devices communicate using ultrasonic transducers and physical phantoms (i.e., tissue-mimicking materials with acoustically accurate representations of anatomy) are interposed between transmitters and receivers to emulate propagation through tissues with high fidelity. ﻿A new generation of miniaturized, less invasive, and Smart Wireless Implantable Medical Devices (SW-IMDs), designed for real-time monitoring of biological biomarkers and with real-time system reconfiguration can now be realized thanks to advances in low-power electronics, sensing, and wireless communications. However, the need for long-term and reliable power supply, together with the need to support innovative functions, impose new powering requirements that can not be satisfied by traditional batteries. Batteries have in fact a major impact on the size and lifetime of the implant, and often need to be replaced every 5-10 years through a surgical procedure, causing discomfort and risks for the patient. We have conducted a thorough investigation of the two main approaches to powering for future medical implants, namely remote energy transfer and energy harvesting. We described the underlying physical principles that regulate the energy transfer processes and the energy conversion mechanisms used to transform the energy produced by human or environmental sources into electrical power. This project provided an extended overview of state-of-the-art technologies, leading remote powering methods, harvesters and scavengers. Some of the most recent prototypes and clinically available devices were briefly described as well. For each technology, advantages and drawbacks were analyzed as well as safety exposure limits to the radiating sources. Finally, we outlined a number of open research challenges that need to be overcome to enable a new generation of self-powered implantable medical devices. ﻿	This project has performed what is, to the best of our knowledge, the first demonstration of a high data rate (0.6 Mbit/s) ultrasonic wireless communication link implemented through Aluminum Nitride (AlN) Piezoelectric Micro Machined Ultrasonic Transducers (PMUTs). Real-time video streaming was demonstrated through a phantom mimicking human tissue, thus proving the feasibility of PMUT-based implantable Body Area Networks (BANs). Two 20×20 PMUT arrays were used as transceiver elements and an Orthogonal-Frequency-Division-Multiplexing (OFDM) modulation scheme was implemented resulting in a wideband digital transmission link with a data rate of up to 0.6 Mbit/s at a 5 cm distance between transmitter and receiver. A variety of potentially life saving implantable medical devices (IMDs), particularly electronic, have been developed at an exponentially accelerating rate in the past 30 years. One of the critical factors limiting this growth is battery life. Because of the invasive nature of installing a medical implant, it is highly desirable to increase the duration between charge cycles to maximize battery life, to reduce the number of invasive procedures in an implant lifetime, as well as to eliminate the need for battery replacement altogether through in-vivo wireless recharging. Challenges that implantable power systems face include constraints on size as existing charging solutions must be significantly scaled down to miniaturize to an implantable level, and restrictions on permissible power transmission within biological tissues placed by the Food and Drug Administration (FDA) or similar regulatory entities. To address these challenges, this project has developed U-Charge, an implantable IoT platform for powering and networking medical solutions through ultrasound. It highlights design challenges and choices made for this platform with a strong emphasis on power transfer efficiency (PTE). To validate that the hardware for this type of platform could be miniaturized for implantable applications two modular printed circuitboards (PCBs), one implementing ultrasonic transcutaneous energy transfer (UTET), and one implementing communication and data processing were designed and fabricated. In the near future, innovative medical therapies will be administered by means of intra-body wireless sensor networks of implantable medical devices (IMDs). However, realizing wireless networks with traditional implantable bio-sensors and actuators is challenging, because (i) they often rely on wired connections that are invasive and prone to infections; and (ii) they are powered by batteries that occupy most of the device volume and have a relatively short lifetime. 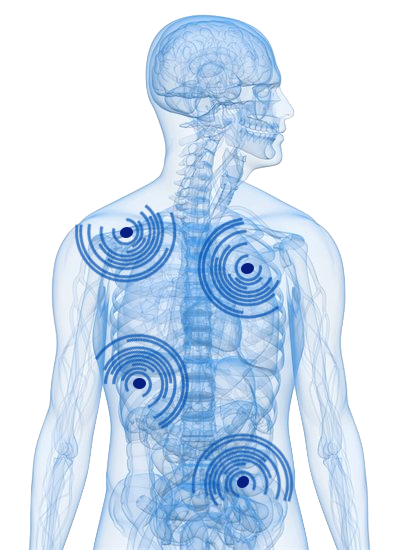 This project developed a system of interconnected implantable nodes that leverage ultrasonic wireless propagation to (i) be remotely recharged, removing the need for batteries; (ii) to create wireless communication links avoiding wires or radio-frequency (RF) connections that have poor performance when operating in tissues. We illustrated the design of the core building blocks to realize ultrasonically rechargeable medical sensors and actuators equipped with ultrasonic connectivity. This project demonstrated for the first time an acoustic duplexer based on Aluminum Nitride pMUTs as radiating elements. The duplexer has the function of efficiently separating independent data-streams coming from the transmit and receive modules while minimizing the noise injected in the channel through the achievement of large out-of-band rejections. Development of new teaching modules. The project outcomes have been incorporated in the course “Wireless Sensor Networks and the Internet of Things” that the PI teaches at Northeastern University, and which is open to senior undergraduate, M.S., and Ph.D. students in Electrical and Computer Engineering. Specifically, the course now includes an entire section on body area networks that discusses the challenges of using classical RF technologies to create intra-body links, as well as intra-body ultrasonic networking and communication techniques developed in this project. Dissemination to various communities of interest. Prof. Melodia has disseminated the technology developed in this project to a number of communities of interest. Among others, Prof. Melodia has given Keynote Speeches at the IEEE International Symposium on Personal, Indoor and Mobile Radio Communications in Bologna, Italy, in September 2019, at the IEEE International Conference on Telecommunications and Signal Processing in Athens, Greece in July 2018, and at the ACM MobiSys 2018 in Munich, Germany, in June 2018. Involvement of undergraduate students in research. One undergraduate student, Mallory Brown, has participated in research in Prof. Melodia’s lab, supervised by Ph.D. student Raffaele Guida. What is the impact on the development of the principal discipline(s) of the project? The project has developed for the first time miniaturized implantable devices that communicate by means of MEMS transducers. What is the impact on other disciplines? The project enables a new generation of miniaturized medical implantabled devices that impacts therapeutical approaches for a number of disciplines. What is the impact on the development of human resources? The project has contributed to the training of three Ph.D. students. What is the impact on technology transfer? The project has led to the development of two patent applications, as described in the products section. What is the impact on society beyond science and technology? Miniaturized implantable devices play a key role in developing new therapies for various chronic conditions. We gratefully acknowledge support from the National Science Foundation. This projet is funded by the NSF under Grant 1618731.